When you create new post offices and domains, Agent objects are automatically created for them. Most agent configuration can be done after installation, but a few settings should be established before you install the agent software. In ConsoleOne, browse to and expand the eDirectory container where the new post office or domain is located to display its contents. Select the Post Office object or Domain object to display its contents. Right-click the Agent object, then click Properties to display the agent Identification page. In the Description field, type a brief description of the agent for display at the agent server console. In the Platform field, select NetWare, Linux, or Windows. Click OK to save the new Agent object properties. Repeat these steps for each new post office and domain for which you are installing agents. Continue with the installation instructions for the platform where you are installing the GroupWise agents. Complete the following tasks to set up the NetWare agents. 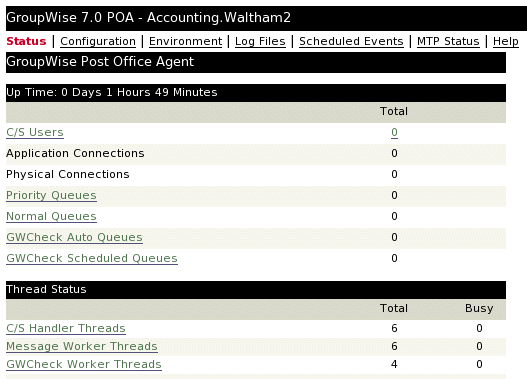 These tasks are designed to help you get the POA and MTA up and running as quickly as possible. IMPORTANT:If you plan to install the GroupWise agents in a clustered server environment, see the GroupWise 7 Interoperability Guide before you install the agents. The NetWare server where the GroupWise agents run should have a static IP address. DHCP should not be used to dynamically assign an IP address for it. Make sure the server where you plan to install the agents has a static IP address. The best /ClosedFileCacheSize setting for a server depends on many things, such as the amount of memory on the server, the load on the POA, and the number of other programs running on the server. For example, the 50000 setting can work well for a server that has 650 MB of memory. Experiment with various settings in order to optimize performance. The default Maximum Packet Receive Buffers setting on a NetWare server is inadequate for the NetWare MTA in configurations that include numerous TCP/IP and remote file connections. Set Maximum Packet Receive Buffers to at least 2500 for the NetWare MTA in such configurations. When the GroupWise agents run on a different NetWare server from where their directories and databases are located, and they are not set up to authenticate through eDirectory (using the /dn startup switch), the agents must use a specific eDirectory username and password to log in to that server. In ConsoleOne, create a new user (such as GWAgents). Provide a password for that user (such as GWise). After you install the agent software, add the /user and /password startup switches to the agent startup files so that the agents can log in to the remote server as the user you have created. If you have selected a directory other than sys:\system to install the agents to (worksheet item 3), add the agent installation directory to the server search path by adding a search command to the autoexec.ncf file. After you have prepared the NetWare server to run the GroupWise agents, you are ready to install them. Map a drive to the NetWare server where you want to install the agents. Make sure you have sufficient rights to install software in the desired directory. 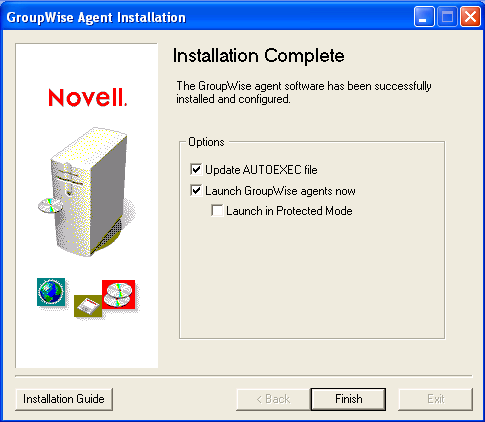 Insert the GroupWise 7 Administrator for NetWare/Windows CD into the CD drive to start the GroupWise Installation program, then click Install Products > Install GroupWise Agents. If the Installation program does not start automatically, run setup.exe from the root of the CD. If you have already copied the agent software to a software distribution directory, run agents\install.exe to start the Agent Installation program. Click Install to install the NetWare agents. The Agent Installation program has created a grpwise.ncf file that contains the commands to start the GroupWise agents on the NetWare server whenever the server starts. Here at the end of the Agent Installation program, you can select how you want to start the agents. Update AUTOEXEC File: Select this option if you want the Agent Installation program to add the grpwise.ncf file to the NetWare autoexec.ncf file so that the agents start automatically whenever the server restarts. Launch GroupWise Agents Now: Select this option if you want the Agent Installation program to start the agents for you immediately. This is appropriate when you have installed the agents on the same server with the domain and post office directories. If you have installed the agents on a remote server from where the domain and post office directories are located, do not select this option. You must manually edit the agent startup files to configure the agents to access the remote servers. This configuration procedure is explained in Editing the NetWare Agent Startup Files. This line automatically starts the agents in Protected Mode when the server restarts. Select the desired agent startup options, then click Finish. If you want to start the agents later or if the Agent Installation program fails to start them successfully, see Starting the NetWare GroupWise Agents. If necessary, modify the agent startup files as described in Editing the NetWare Agent Startup Files, then manually start the NetWare agents by running grpwise.ncf. When viewing the agent Web console, you can specify the POA client/server port, the MTA message transfer port, or the default HTTP port that is established during installation. The POA client/server port and the MTA message transfer port are automatically redirected to their respective HTTP ports. The Agent Installation program creates a customized agent startup file for each domain and post office location. The first 8 characters of the post office and domain names became the names of the agent startup files, along with an agent-specific extension. For example, if the post office name is acctpo, then the POA startup file is named acctpo.poa. The Agent Installation program also customizes each startup file with the correct /home switch setting, pointing to the domain or post office directory. Each startup file also provides a comprehensive list of startup switches, with all but the /home switch commented out. You can use any ASCII text editor to set the startup switches. The agent startup files are located in the agent installation directory. When the MTA is not on the same server as the domain directory, you need to edit the MTA startup file to include the MTA’s eDirectory distinguished name. When the POA is not on the same server as the post office directory, you need to edit the POA startup file to include the POA’s eDirectory distinguished name. After modifying the startup files, use the grpwise.ncf file to start the NetWare agents from the NetWare server console. If you want to learn more about running the NetWare agents, continue with Starting the NetWare GroupWise Agents. If you want to customize the configuration of the NetWare agents or expand your GroupWise system, skip to Section 7.5, What’s Next. If you encounter any problems starting the GroupWise agents, see Strategies for Agent Problems in GroupWise 7 Troubleshooting 2: Solutions to Common Problems for assistance. The startup file for the POA is named after the post office. The startup file for the MTA is named after the domain. The startup file for the Internet Agent is always gwia.cfg. The WebAccess Agent startup file is named after the WebAccess Agent object in eDirectory (typically webacc70a). During installation, the grpwise.ncf file is configured with one or more POA and/or MTA load commands depending on the domains and/or post offices you listed during installation. When the GroupWise agents are running smoothly, you should modify the main NetWare configuration file (autoexec.ncf) to load the NetWare GroupWise agents automatically whenever you restart the server. You can add either the load commands or the NCF commands to the autoexec.ncf file. At the NetWare server console, use Exit (F7). If a GroupWise agent does not respond to Exit (F7), you can use the unload command to unload the agent NLM. For WebAccess, you can use the stopweb command. If you move the GroupWise agents to a different server, you can uninstall the agent software from the old location to reclaim disk space. Stop the POA and the MTA, then run the Agent Installation program (install.exe) in the \agents subdirectory of the GroupWise software distribution directory or GroupWise 7 Administrator for NetWare/Windows CD. On the Install/Uninstall page, select Uninstall, then follow the prompts. Stop the Internet Agent. If no other GroupWise agents are running on the server, delete the Internet Agent software files listed in NetWare Installation Directory in Directory Structure Diagrams in GroupWise 7 Troubleshooting 3: Message Flow and Directory Structure. Stop the WebAccess Agent. Delete the WebAccess Agent software files listed in NetWare Installation Directory in Directory Structure Diagrams in GroupWise 7 Troubleshooting 3: Message Flow and Directory Structure. If you want to delete the WebAccess Application from your Apache Web server, locate the WebAccessUninstall.ini file under the Tomcat root directory (for example, under \tomcat\4). 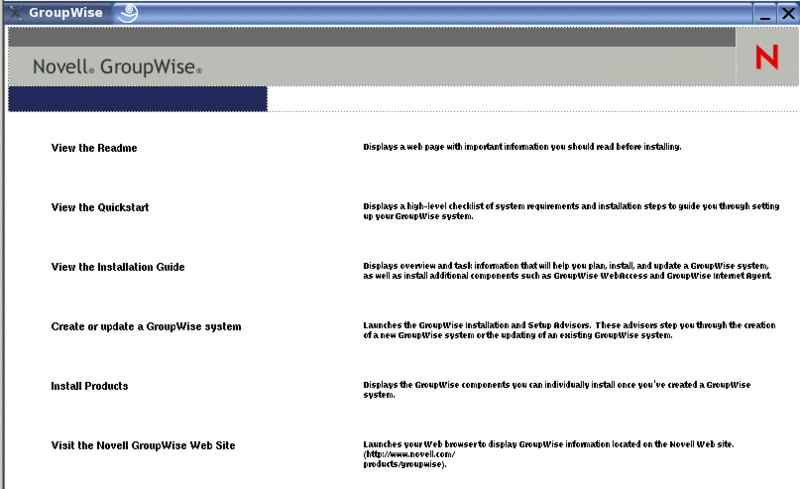 It lists all files that the GroupWise Installation program installed to your Web server. Delete the listed files to uninstall the WebAccess Application from your Web server. IMPORTANT:If you added load commands to the autoexec.ncf file to automatically start the agents when the NetWare server starts, edit the autoexec.ncf file and remove the agent load commands. Complete the following tasks to set up the Linux agents. These tasks are designed to help you get the Linux agents up and running as quickly as possible. The sux command enables the X Window System, which is required for running the GUI GroupWise Installation program. If you are not using the X Window System, you can install GroupWise components individually, as described in Installing the GroupWise Agents Using the Text-Based Installation Program. Start the GroupWise Installation program. Click Install Products > GroupWise Agents > Install Agents. 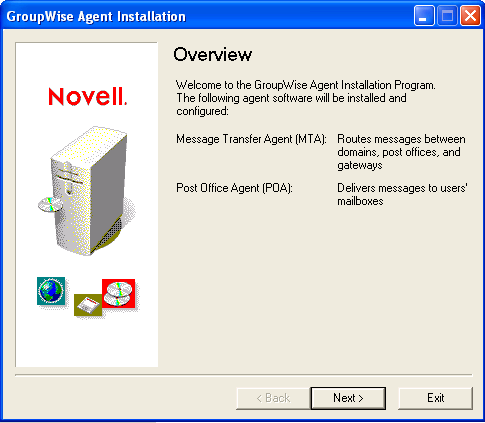 The GroupWise agent software is installed to /opt/novell/groupwise/agents. The agent installation and configuration steps are separate so that you can install updated agent software without repeating the agent configuration steps. Follow the prompts to provide Linux Agent information from your GroupWise Agent Installation Worksheet. Skip to Starting the Linux Agents with a User Interface or Starting the Linux GroupWise Agents as Daemons depending on whether or not you want a user interface on the Linux server where the agents run. If you want to install any of the GroupWise agents on a server where the X Window System is not running, you can use the text-based GroupWise Installation program. 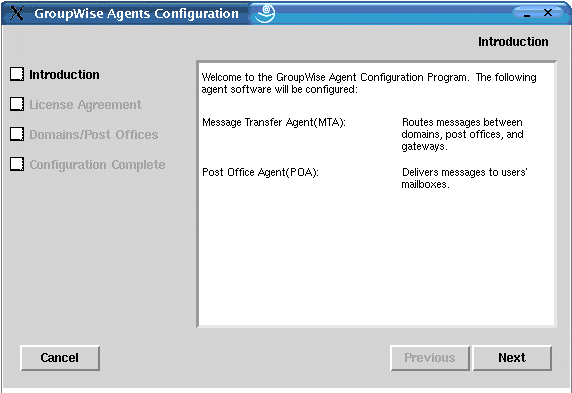 You must use ConsoleOne to create the associated domain or post office before you can configure the agent software. NOTE:If you need to perform the installation from a remote location, you can use ssh to access the remote Linux server. Copy the GroupWise 7 Administrator for Linux CD to the server where you want to install the agent software, then run the text-based GroupWise Installation program to install the agents on the Linux server. Enter the number of the language you want to use for the installation. Enter the number of the language you want to use for reading the License Agreement. Press any key to scroll through the License Agreement, then enter y to accept the License Agreement. In the list of agents, enter the number for the GroupWise agent component that you want to install. A status bar indicates progress. When the installation is complete, enter y to configure the agent component. Follow the prompts to provide the configuration information, then press any key to exit. In the text-based Installation program, you can press Ctrl+C to return to the previous menu. When you have installed the agents that you want to run on the text-only server, skip to Starting the Linux GroupWise Agents as Daemons. The sux command enables the X Window System, which is required for running the GUI GroupWise agent server consoles. The --show startup switch starts the MTA with a server console interface similar to that provided for the NetWare and Windows MTA. This user interface requires that the X Window System and Open Motif be running on the Linux server. The @domain.mta startup switch specifies the MTA startup file, which contains the --home startup switch. The MTA startup file is named after the domain that the MTA services. The Installation program created the MTA startup file in the /opt/novell/groupwise/agents/share directory. Because the Installation program prompted you for the domain directory, it set the --home switch for you in the startup file. In ConsoleOne, you can see that the MTA has updated the domain database because the Version field on the Identification page of the Domain object shows 7 when the database update is complete. Wait until the domain database has been updated before you start the POA. The --home startup switch specifies the post office directory and is required to start the POA. The @post_office.poa startup switch specifies the POA startup file, which contains the --home startup switch. The POA startup file is named after the post office that the POA services. 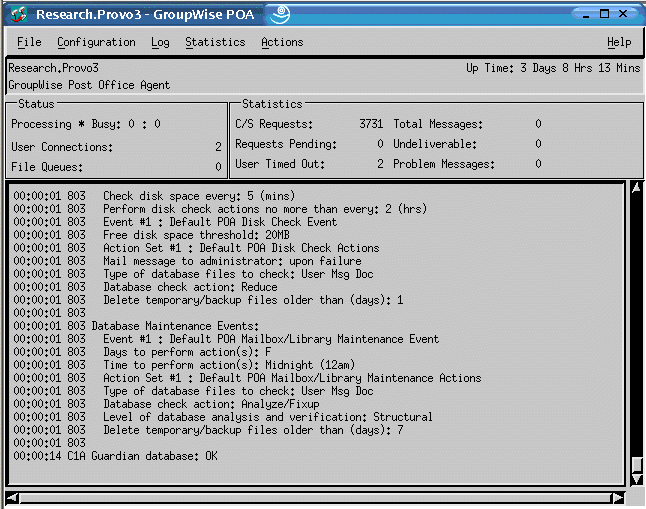 The Installation program created the POA startup file in the /opt/novell/groupwise/agents/share directory. Because the Installation program prompted you for the post office directory, it set the --home switch for you in the startup file. In ConsoleOne, you can see that the POA has updated the post office database because the Version field on the Identification page of the Post Office object shows 7 when the database update is complete. After the post office database has been updated, users can connect to the post office using either the Cross-Platform client or the Windows client. When you start the Linux agents with a user interface, you can use the agent server consoles described in Using the POA Server Console in Post Office Agent and Using the MTA Server Console in Message Transfer Agent in the GroupWise 7 Administration Guide. All of the Linux GroupWise agents except the Monitor Agent can be started using the grpwise script. The Monitor Agent uses its own customized grpwise-ma script that works essentially the same way. When using the grpwise script, you refer to the agents by the location names displayed when you list agent agent status (without the brackets), not by the names of the agent executables. NOTE:The GroupWise agents are Run Control compliant. During installation, a symbolic link is created from /etc/init.d/grpwise to /usr/sbin/rcgrpwise. Typically, /usr/sbin is already on your path, so you can run rcgrpwise from any directory, rather than changing to /etc/init.d in order to run the grpwise script. A /usr/sbin/grpwise-ma link is also created. When you use the grpwise script to start the GroupWise agents as daemons, they run without a user interface. 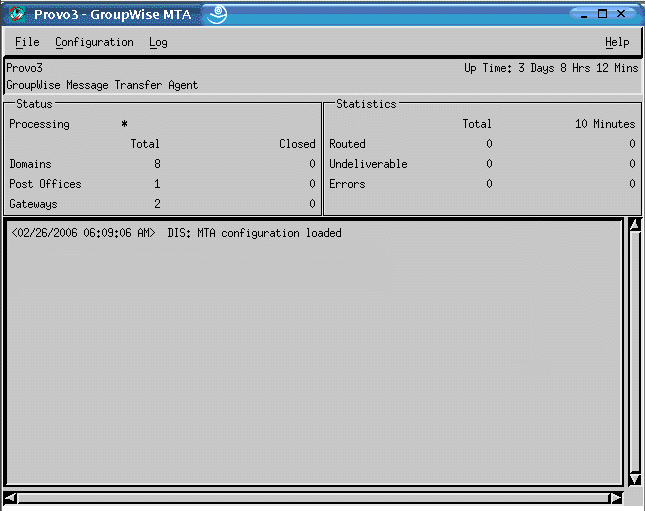 If GroupWise Messenger agents are installed on the same server, the grpwise script also starts them. For more information about the agent Web consoles, including instructions on protecting the agent Web consoles with passwords see the following sections in the GroupWise 7 Administration Guide. If you selected Launch GroupWise Agents on System Startup in any Agent Installation program, the Agent Installation program configured your system so that the agents start automatically each time you restart your server. The Agent Installation programs always creates a grpwise startup script in /etc/init.d for starting the agents, as described in Starting the Linux GroupWise Agents as Daemons. To enable automatic startup, the Agent Installation programs also create symbolic links named S99grpwise in the rc3.d and rc5.d directories so that the agents load on restart into level 3 or 5, depending on the configuration of your Linux system. When the grpwise script runs and starts the GroupWise agents, the agents read the agent startup files in /opt/novell/groupwise/agents/share to check for configuration information provided by startup switches. Because the --show switch cannot be used in the startup files, the agents never run with server console interfaces when started automatically when the server restarts. For security reasons, it is preferable that the GroupWise agents not run with root user privileges. For example, if an intruder manages to assume the identity of a GroupWise agent, the intruder gains all the privileges of the commandeered process. If the process is running with root user privileges, then the intruder has root access to your system. If the process is running as a user with minimal privileges, then the intruder has only restricted access to your system. Therefore, your system is more secure if the GroupWise agents do not run as root. The root user still needs to start the agents, because the agents do need to access some root-only resources on startup. However, you can configure the agents to switch to a different user after they start. After the agents are running as the non-root user, they need adequate access to the locations where each domain, post office, library, and software distribution directory is located. NOTE:You can configure the POA, the MTA, and the Internet Agent to run as a non-root user. The WebAccess Agent, with its accompanying Viewer Agent, must still run as root. Unlike the other agents, the Monitor Agent can be started as a non-root user by default, so no setup is required for it to run as a non-root user. Select a Linux user for the agents to run as and make sure that the user is listed in the /etc/passwd file. You might want to create a new user specifically for this purpose, perhaps named gwagents. Create a file named uid.conf. Stop and then start the agents. While starting as root, the agents automatically change the ownership of the domain and post office directory structures from root to the user you specified in the uid.conf file. Then they switch users and run as the user you specified, rather than as root. If you list the agent processes, you can observe that they are no longer running as root. If the post office and domain are located on different servers, you must complete the above steps on each server. IMPORTANT:All agents running on the same server must run as the same user. If you later want to change the user that the agents are running as, follow the instructions in Changing the Non-root User. When your domains, post offices, libraries, and software distribution directories are located on a Novell Open Enterprise Server (OES) Linux NSS volume, you must set up an eDirectory user for the agents to run as and you must LUM-enable that user. On OES Linux, you can use Novell iManager to accomplish these tasks. Select or create an eDirectory user for the agents to run as. From the Open Enterprise Server Welcome page in your Web browser, expand Network Management, then click iManager 2.5.x. In the iManager Links box, click Open Novell iManager 2.5. To log in to iManager, specify a username, a password, and a tree. In the left pane, expand Users, then click Create User. Provide the required information, then click OK.
LUM-enable the user you just created. In the left pane, expand Linux User Management, then click Enable User for LUM. Browse to and select the user you just created, then click OK. Select the primary group for the user to belong to (for example, admingroup). Change /bin/bash to /bin/false because the user does not need a shell. Click OK to LUM-enable the user. Create a new agents directory, then change to that directory. The POA needs access to the post office directory. The MTA and the Internet Agent need access to the domain directory. To prevent an agent from running as a different user than the one for which it was originally configured, the GroupWise agents create a uid.run file in the domain or post office directory that they service. This could happen if the user specified in the uid.conf file is manually edited, or if the uid.conf file is deleted, thus changing or removing the information about the user that the agent should run as. If this message appears, verify that the uid.conf file specifies the desired user, then delete the uid.run file. After displaying the message, the agent does not start, because it no longer has appropriate permissions in the domain or post office directory that it needs to service. By deleting the uid.run file, you enable the agent to reset the permissions in the domain or post office directory to appropriate user and then start successfully. If you want the agent to run as a different non-root user, modify the uid.conf file in the /etc/opt/novell/groupwise/agents directory to specify the desired non-root user, then delete the uid.run file from the domain or post office directory serviced by the agent. If you want the agent to run as root, delete the uid.conf file from the /etc/opt/novell/groupwise/agents directory and delete the uid.run file from the domain or post office directory serviced by the agent. The GroupWise High Availability service makes sure that if the MTA, the POA, the Internet Agent, or the WebAccess Agent with its accompanying Document Viewer Agent goes down for any reason, it starts again automatically. On NetWare, this capability is provided by using a restartable protected address space. On Windows, Microsoft Clustering Services automatically restarts a service that is not responding. However, on Linux, some clustering environments do not include this capability, so it is built into the Linux GroupWise agents. The GroupWise High Availability service (gwha) is installed automatically, starts when your server boots, and makes sure that any GroupWise agents installed on the server are running. It relies on the Monitor Agent to detect when a GroupWise agent is no longer running. The Monitor Agent notifies the High Availability service of any problem, then the High Availability service immediately issues the command to start the problem agent. A single Monitor Agent can service multiple instances of the High Availability service on multiple servers, as long as all instances use the same username and password to communicate with the Monitor Agent. The High Availability Service is controlled by a configuration file (gwha.conf) located in the /etc/opt/novell/groupwise directory. The configuration file provides a section for configuring SSL for communication between the High Availability service and the Monitor Agent, followed by sections for each GroupWise agent installed on the server, as shown below. The headings for the sections match the agent locations listed in Starting the Linux GroupWise Agents as Daemons. Before starting to configure the High Availability service, test the agents by starting and stopping them manually with a user interface so that their agent server consoles display. Change to the root directory of the Linux server. Start the GroupWise agents manually, including providing the full path to the executable and including the --show switch, to make sure that they are set up and configured correctly. After verifying that the agents start correctly, stop the agents. If you use SSL, you need to modify the High Availability service configuration file (gwha.conf). Change to the /etc/opt/novell/groupwise directory. Save the file, then exit the text editor. If you want to control how the script manages starting and stopping the agents, modify the delay = and wait = settings in the High Availability service configuration file (gwha.conf). The delay = setting controls the length of time between when the script issues the command to start an agent and when the script displays a message indicating that the agent has started. The default delay time is 2 seconds. Under certain circumstances, an agent could encounter a problem and fail to start after 2 seconds. In this case, you would receive the success message but the agent would not be running. You need to increase the delay = setting to accommodate the length of time it typically takes for the agent to start successfully on your system. The wait = setting controls the length of time between when the script issues the command to stop an agent and when the script kills the agent if the agent has not yet stopped. The default wait time is 10 seconds. Under certain circumstances, an agent could take longer than 10 seconds to perform a normal shutdown, and killing the agent under those circumstances would not be appropriate. You need to increase the wait = setting to accommodate the length of time it usually takes for the agent to shut down. A message notifies you if the script kills an agent because its shutdown exceeds the wait = setting. The default settings are usually appropriate, so you do not need to change them unless you frequently encounter problems with starting or stopping an agent using the script. Change the delay = and wait = settings as needed. If you want the script to start the agents with a user interface on the Linux server, add the show = setting in the High Availability service configuration file (gwha.conf). This is equivalent to using the --show startup switch on the command line when starting the agent. Add show = yes to the section for each agent that you want to start with a user interface. If you need to eliminate the user interface, use show = no or delete the show = line from the file. In YaST, click Network Services > Network Services (inetd). If necessary, select Enable to activate the list of services. Scroll down to the gwha line, select it, then click Toggle Status (On or Off) to change the status to On. Start the agents as daemons. Create a new user and associated password on your Linux server to represent the High Availability service. You might name it gwha. Continue with Configuring the Monitor Agent to Communicate with the High Availability Service. After you have the High Availability service set up and working correctly, you need to configure the Monitor Agent to communicate with it and test it to make sure that you can rely on it in the future. Start the Monitor Agent with the --hauser and --hapassword startup switches. Change to the /etc/init.d directory, then edit the grpwise-ma script. Remove the pound sign (#) from the beginning of the line. Replace username and password with the username and password you established in Step 8 in Configuring the High Availability Service. MA_OPTIONS="--hauser gwha --hapassword gwagents --hapoll 120"
The --hapoll switch specifies that the Monitor Agent should check the status of GroupWise agents every 120 seconds. You can use the MA_OPTIONS variable to add any Monitor Agent startup switches to the grpwise-ma script as needed. For information about Monitor Agent startup switches, see Using Monitor Agent Switches in Monitor in the GroupWise 7 Administration Guide. Stop one of the agents. Check the status of the agent you stopped to make sure it is stopped. Wait for the next Monitor Agent polling cycle. You can check and, if necessary, change the Monitor Agent polling cycle in the Monitor Agent Web console. Click Preferences, then scroll down to the HTTP Settings section. After the polling cycle has passed, check the status of the agent again. The agent that you stopped should now be running again. NOTE:Although you would typically use the Linux Monitor Agent to monitor other Linux GroupWise agents, the Windows Monitor Agent can be used to monitor the Linux agents and communicate with the High Availability service. How you stop the Linux GroupWise Agents depends on how you started them. When you use the --show startup switch to start the GroupWise agents, you can stop them from the agent server console interface. Click File > Exit > Yes. Since the WebAccess Agent does not have the same type of agent server console as the other Linux agents, you can stop it by closing the terminal window in which it is running. When you start the GroupWise agents with the grpwise script, you can also use the script to stop them. The same applies for the Monitor Agent and its grpwise-ma script. IMPORTANT:For convenience in typing the command, the agent_location_name is not case sensitive. When you start the GroupWise agents manually on the command line (without using the grpwise script), use the standard Linux kill command to stop them. All of the PIDs for the specified agent are listed. It might take a few seconds for all agent processes to terminate. Repeat the ps commands to verify that the agents have stopped. The -HUP (hang up) option is equivalent to using Restart in the MTA and Internet Agent server console or Web console. Because the other agents do not have a Restart feature in their consoles, the -HUP option cannot be used to restart them. The Windows server where the GroupWise Windows agents run should have a static IP address. DHCP should not be used to dynamically assign an IP address for it. Make sure the server where you plan to install the Windows agents has a static IP address. The Windows POA requires direct access to the post office directory so that it can write to the post office database. The Windows MTA requires direct access to the domain directory so that it can write to the domain database. If the agents are not installed on the same server where their directories are located, make sure the server has drives mapped to all locations where the agents need access. If you are running the Windows POA for a post office located on a NetWare server, you might need to increase Maximum File Locks Per Connection from its default setting on the Windows server. After installation, the agents can access their directories using either mapped drives or UNC paths. However, mapped drives are required during installation so that the agent startup files can be set up properly. If you specified a new Windows username and password under worksheet item 9, create the new Windows user account so it is ready when you start the agents for the first time. In the Windows Control Panel, double-click Users and Passwords to add a new user. Grant the user Full Control rights in the domain and post office directories. If you want to monitor the GroupWise Windows agents from an SNMP manager program, such as the Management and Monitoring Services component of Novell® ZENworks Server Management, SNMP must be enabled on the Windows server where the agents are installed. If it is not already enabled, you should enable it before you run the Agent Installation program. In the Windows Control Panel, double-click Add/Remove Programs. After you have prepared the Windows server to run the GroupWise Windows POA and MTA, you are ready to install them. Make sure you have mapped drives to all domain and post office directories for which you are installing agents. Follow the prompts to provide the Windows Agent information from your GroupWise Agent Installation Worksheet. On the Installation Complete page, choose whether or not you want the Agent Installation program to start the agents for you immediately, then click Finish. If you want to start the agents later or if the Agent Installation program fails to start them successfully, see Starting the Windows GroupWise Agents. When viewing the agent Web console, you can specify the POA client/server port, the MTA message transfer port, or the HTTP established during installation. If you want to learn more about running the Windows agents, continue with Starting the Windows GroupWise Agents and Stopping the Windows GroupWise Agents. If you want to customize the configuration of the Windows agents or expand your GroupWise system, skip to Section 7.5, What’s Next. On the Windows desktop, click Start > Programs, select the GroupWise agent, then start the GroupWise agent. After the GroupWise agents are running smoothly, you should add them to the Windows Startup group to start them automatically whenever you restart the Windows server. From the Windows desktop, click Start > Settings > Taskbar & Start Menu > Advanced > Add. Browse to the directory where you installed the GroupWise agent. Double-click agent executable, then if necessary, add the startup file to the command line. The startup file for the POA is named after the post office. The startup file for the MTA is named after the domain. The startup file for the Internet Agent is always gwia.cfg. The WebAccess Agent startup file is provided in strtweb.bat. The Monitor Agent does not use a startup file. Select the Startup folder, provide a name for the shortcut, then click Finish. All programs in the Startup folder are automatically started when the server reboots. If possible, restart the server to verify that the GroupWise agents start automatically. If you installed the GroupWise agents as services, you can manage them just like you would any other Windows services. NOTE:The Monitor Agent cannot currently be installed as a Window service. From the Windows desktop, click Start > Settings > Control Panel > Administrative Tools. Double-click Services, select the agent service, then click Start. The POA service is named after the post office. The MTA service is named after the domain. The Internet Agent service is named GWIA. The WebAccess Agent service is named WebAccess (webaccess_agent_object_name). You can check the status of the agent service by using the Windows Event Viewer. From Administrative Tools, double-click Event Viewer, click Application Log, sort the log entries on the Source column, scroll to the agent service, then double-click a log entry to view information about it. To configure the agent service to start automatically when the server reboots, right-click the agent service, then click Properties. In the Startup Type field, click Automatic, then click OK. When the GroupWise agents run as applications, you can stop them from their server consoles. At the POA server console, click File > Exit. At the MTA server console, click File > Exit. At the Internet Agent server console, click File > Exit. From the Windows desktop, click the title bar of the window in which the WebAccess Agent or Document Viewer Agent is running, then press F7. At the Monitor Agent server console, click Configuration > Exit. If the GroupWise agent does not respond to Exit, you can close the agent server console window to stop the agent or use the Windows Task Manager to terminate the agent task. When the GroupWise agents run as Windows services, you can stop them as you would any other Windows services. Double-click Services, select the agent service, then click Stop. Stop the POA and the MTA, then run the Agent Installation program (install.exe) in the \agents subdirectory of the GroupWise software distribution directory or GroupWise 7 Administrator for NetWare/Windows CD. On the Install/Uninstall page, select Uninstall, then follow the prompts. This deletes most of the contents of the c:\grpwise directory and uninstalls the POA and the MTA as Windows services. Stop the Internet Agent, then run the Internet Agent Installation program (install.exe) in the \internet\gwia subdirectory of the GroupWise software distribution directory or GroupWise 7 Administrator for NetWare/Windows CD. On the Install/Uninstall page, select Uninstall, then follow the prompts. This deletes most of the contents of the c:\grpwise\gwia directory and uninstalls the Internet Agent as a Windows service. Stop the WebAccess Agent. Delete the contents of the c:\webacc directory to delete the WebAccess Agent software. If the WebAccess Agent was running as a Windows service, run “Delete Service.exe” in the \internet\webacces subdirectory of the GroupWise software distribution directory or GroupWise 7 Administrator for NetWare/Windows CD. If you want to delete the WebAccess Application from your Apache Web server, locate the WebAccessUninstall.ini file under the Tomcat root directory (for example, under \tomcat\4). It lists all files that the GroupWise Installation program installed to your Web server. Delete the listed files to uninstall the WebAccess Application from your Web server. Stop the Monitor Agent. Delete the contents of the c:\gwmon directory.